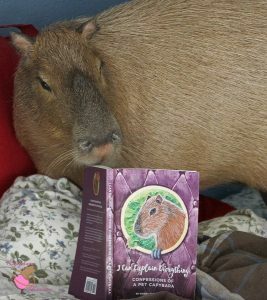 I am NOT chewing on it, I am reading! Dobby and I have a lot in common. 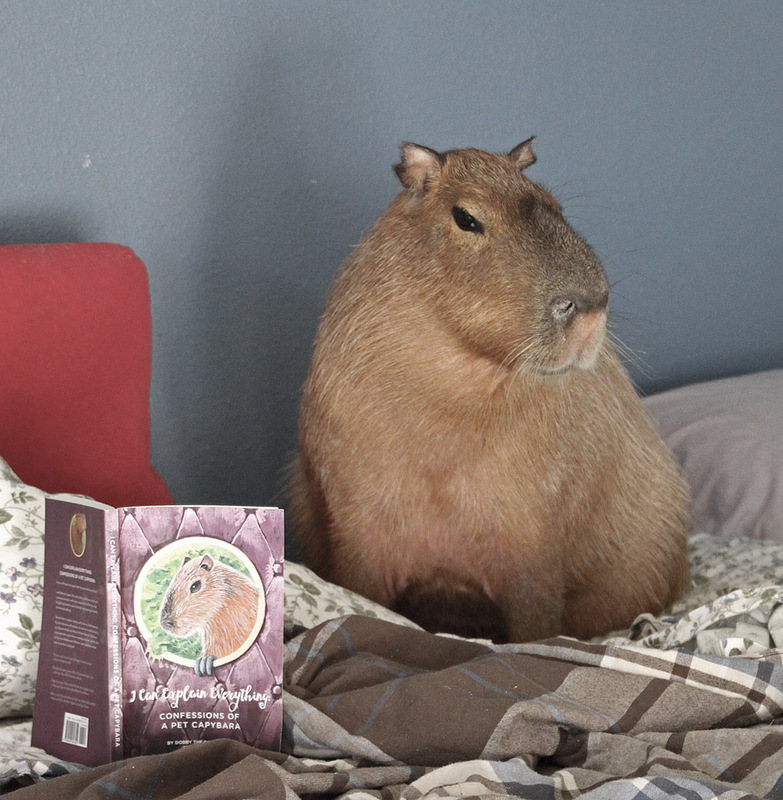 We are both capybaras, we are both pets, and we both love corn. That’s a whole lot! If he weren’t a boy, we might be identical twins. 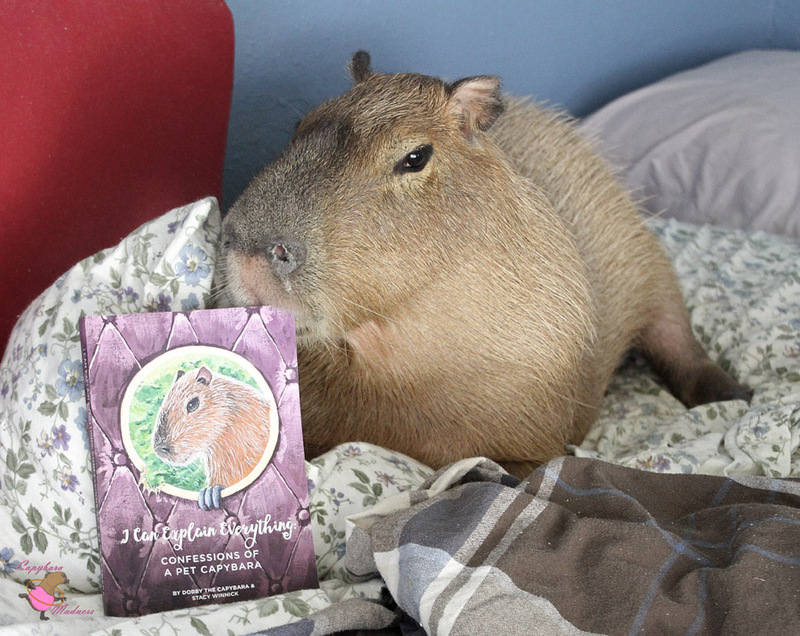 You can see that by comparing the illustration on the cover to my adorable face right next to it. We look related, don’t we? But on to the book. I cannot believe how well Dobby explains what his life is like! Did you know he has multiple servants? He’s got The Farm Manager, The Housekeeper, The Bartender, and some other miscellaneous people whom he refers to as human this or human that. Personally, the only human I pay much attention to is MelT, and I ignore her most of the time. But Dobby is more pampered than I am so he depends on his humans more. Can you believe Dobby lives OUTSIDE nearly all the time! I couldn’t handle it. I would be scared that there are jaguars out there. Or maybe crocodiles swim around in my pool during the day. That’s another weird thing about Dobby, he’s up during the day and sleeps at night! He’s got that all backward. Regardless of how much we look alike (see photo above), Dobby and I couldn’t be more different. I learned all about his life, from babyhood to old age (Dobby is eight which he swears isn’t old, but…). Did you know he almost died THREE times? And none of those were due to jaguars. The world is even more dangerous than I thought! I know some of you are thinking that you would love to live with a capybara. Well, this might make you think twice. We capys are very demanding, although our cuteness more than makes up for it. Whether you are thinking about getting a pet capybara or not, this is absolutely the book for you. You’ll want to read it twice, or even three times. There’s a lot hidden between the lines so a re-read is definitely worthwhile. Go right now to amazon to get your own copy! You won’t regret it. And don’t forget to leave a review, Dobby is like me in that he needs constant praise, as he deserves. Well done, Prince Dobablob! Your autobiography is a masterpiece! I can totally see the resemblance between you and Donny. What a glowing review for his book! You might have a new career as a book reviewer. Skipper Rous you and Dobby do look alkie. So very cute. I totally agree with you about the book and how fascinating you Capybaras really are. Would love to leave a review of Dobbys book . But amazon keeps pushing me off their site. Maybe because I am not an amazon customer.